In the last year, you may have seen a new Ted-ed video being shared about Effective Practice, written by Annie Bosler and Don Greene (of performance success/audition success). It's a good video, especially for students who may not be recreationally reading books about myelin, practice habits, or things like the "Talent Code" or "Mindset." The video does a great job of addressing some major points about practice, but let's tackle a few things. 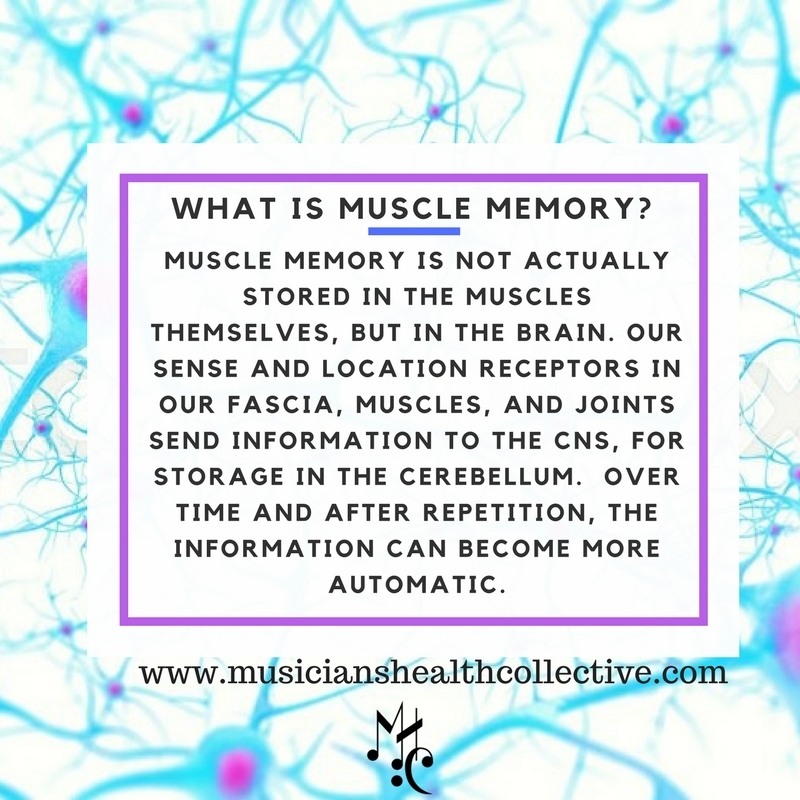 What is muscle memory? It's not so much the actual muscles remembering the task, but the brain's memory of movement or actions. We have mechanoreceptors (sense receptors) and proprioceptors (location receptors) in our muscles, fascia, tendons, and joints that are responding to movement input and body placement, and then sending information to the brain. The Perkinje cells of the cerebellum encode information and data, while repetition allows the brain to store less task specific data over time, i.e., it becomes more masterful. We can also, unfortunately, log inaccurate and wrong data about movement, as in if someone learns something incorrectly, it can be very difficult to unlearn it after practicing it. Frequent and quality repetition helps the brain put the movements to memory, allowing the movements to become procedural over time. We've all seen this in a music context, especially with younger/beginning students who may repeat a mistake over and over again, and have difficulty unlearning it. For example, I took beginning tap dance classes this spring, and I'm not particularly great. My brain has to work really hard to coordinate the steps. Over time, things have gotten better, but it's still a fun challenge. However, running, walking, and warmups on my instrument are very much intuitive acts in my procedural memory, and I'm not actively thinking and coordinating those actions much. Image courtesy of Neuroscience and Psi. Oh and what's the big deal about myelin? "Myelin is a fatty white substance that prevents energy loss from electrical signals traveling from the brain to the body." (via Ted-ED) There is little myelin around neurons at birth, but throughout childhood, myelination begins to occur. Myelinated neurons allow for faster electrical signals to travel between neurons via saltatory conduction (thanks, anatomy textbook). But more importantly, the research that's been done so far, both on musicians, athletes, and other performers, is that increased practice yields increased myelin. For more on that, read The Talent Code, by Daniel Coyle. Side note, demyelination is the gradual loss of the myelin sheath surrounding the nerves, often correlated with multiple sclerosis, Guillain–Barré syndrome, and Charcot-Marie-Tooth disease. If myelin assists in neuron signal transport, then the subsequent loss of myelin can be catastrophic. Great video though- definitely worth sharing and watching!